Cargo Systems provides the highest quality slings in the industry. They are custom made to your particular specifications. Our customers can easily choose the style, length, thickness, width, and quantity and we’ll make it for them quickly and inexpensively. If you don’t know what kind of sling you need, we’re here to help you out. Click on one of the links below, or call a Cargo Systems representative today, and we’ll be glad to assist you. TYPE 1 – Sling made with a triangle fitting on one end and slotted triangle choker fitting on the other end. Made in One or Two Ply. TYPE 2 – Sling made with a triangle fitting on both ends. Typically light duty usage. TYPE 3 – A flat-loop eye sling. Can be manufactured in 1, 2, 3, or even 4 Ply for added breaking strength. Loops are Cordura lined for extra protection from wear. Light duty and heavy duty available. TYPE 4 – Twisted eye slings. These are available in in 1, 2, 3, or 4 Ply, also. Light duty and heavy duty available. TYPE 5 – Endless sling, sometimes referred to as continuous loop slings. Available in various lengths and strength. Also available in in 1, 2, 3, or 4 Ply. TYPE 6 & 7 – Cordura-lined Reversed Eye Slings. Type 6 is typically for more heavy duty use, but both are very strong, long-lasting designs. 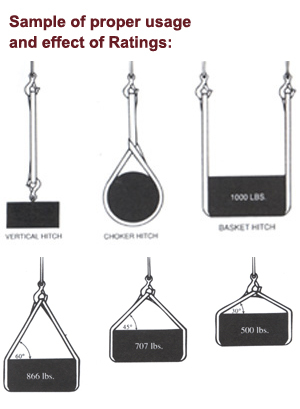 TYPE 8 & 9 – Wide-body Basket Slings. These slings are perfect for load-leveling situations. When you need more webbing that strength, you need a wide-body sling. Call or email a Cargo Systems Representative for assistance. Tubular Polyester Round Slings – Endless sling, sometimes referred to as continuous loop slings. Available in various lengths and strength. Also available in in 1, 2, 3, or 4 Ply.